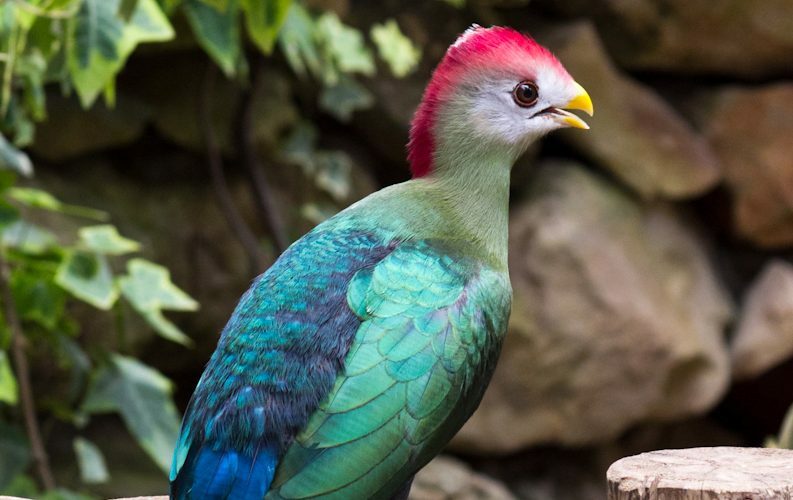 Red-crested Turacos are curious, intelligent birds that often live in large noisy flocks. They are not great flyers, preferring to run through the treetops. They semizygodactylus, meaning their outer toe is able to rotate front to back. This adaption is what makes running and hopping through the trees so easy. The female lays 2-3 eggs in a nest made from twigs. Both the male and female incubate and care for the hatchlings until they are able to care for themselves. The call of the Red-crested Turaco sounds a bit like someone saying “go away”. This has earned them the nickname “go-away birds”.